I have never believed in expending more energy as a farrier than I absolutely have to, and this came home to me at a recent course where I had a young farrier attending one of my advanced courses over five days. 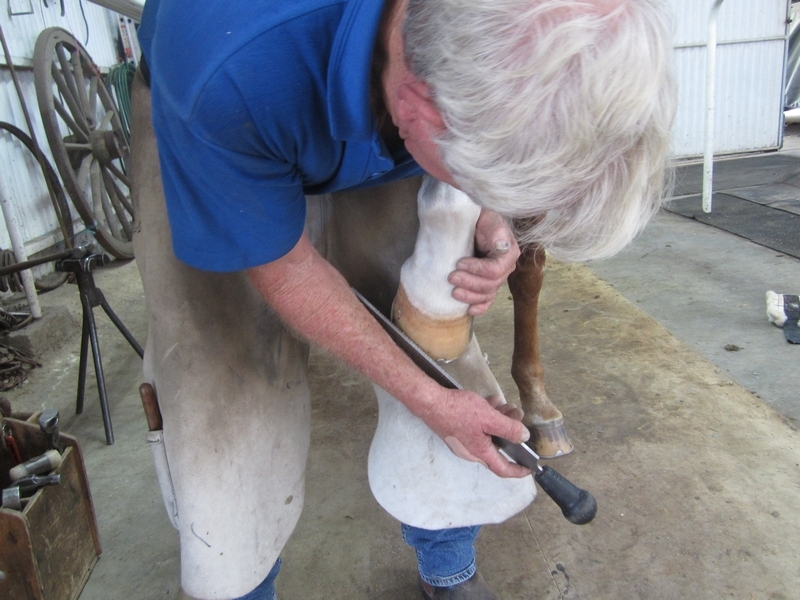 The self-taught farrier knew he was working too hard and wanted to refine and improve his methods. For a career farrier, it is important to be able to increase workload and at the same time to conserve energy wherever possible without taking shortcuts; also to keep the body fit and healthy, particularly the back, and to challenge the mind so that burnout and complacency don’t finish the career prematurely. I believe that it’s OK to be lazy if it benefits the farrier, but only if it also benefits the horse. For a career farrier, persistence in learning to use a rasp in either hand pays huge dividends over a career span. Most farriers will not attempt to be ambidextrous, so they have to place themselves in what I call the ‘suicide position’ (Pic 4a front &4b hind) when taking the hoof forward, to rasp or hammer the outside edge of the hoof wall. If the horse runs forward when working on the fronts in that suicide position or if it pulls back when working in that position when working on the hinds you will get injured. Again, it is easier and safer to learn to swap hands with the rasp. 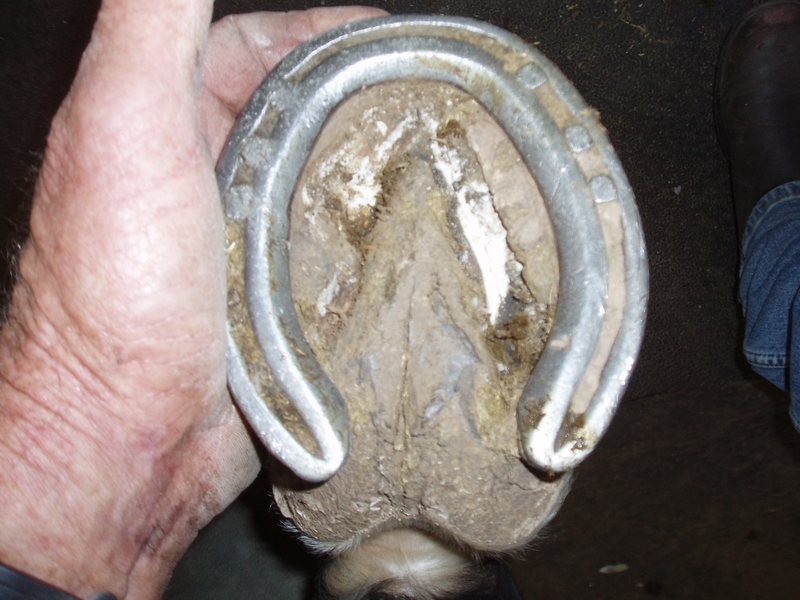 (Pic 5a and 5b) Note that the hoof should never be rasped above the clinch line; if the flares are removed from the bottom of the hoof wall, then rasping when taking the hoof forward is minimised. The young farrier at my course was so open minded to change, that by day two he was rasping and hammering with both hands to avoid putting the hoof down just to change positions and use the other hand. 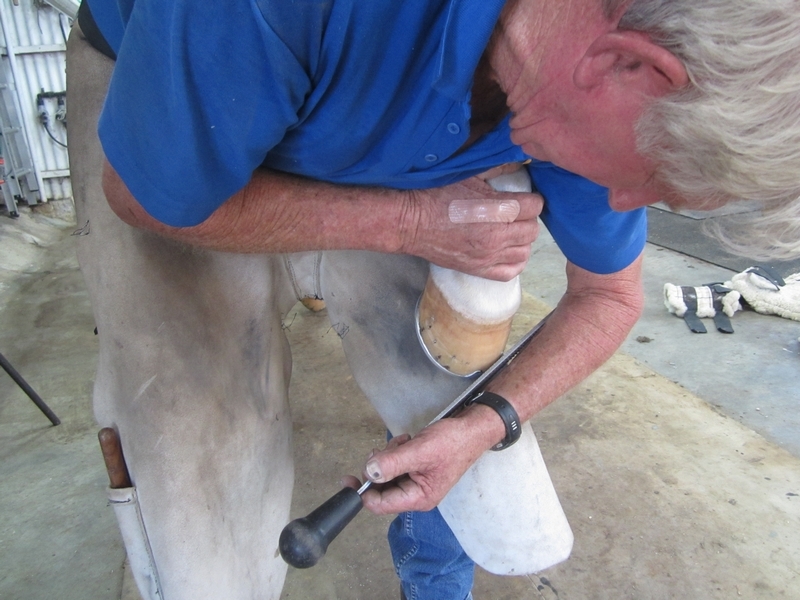 It is harder to hammer than to rasp with the other hand, but it is worth persisting, especially for young farriers, as the time it saves over a career generates a lot of extra income. He found that by using my tool box, he didn’t have to bend down as far to reach his tools, so by the end of day two he had sworn off using his tool roll. 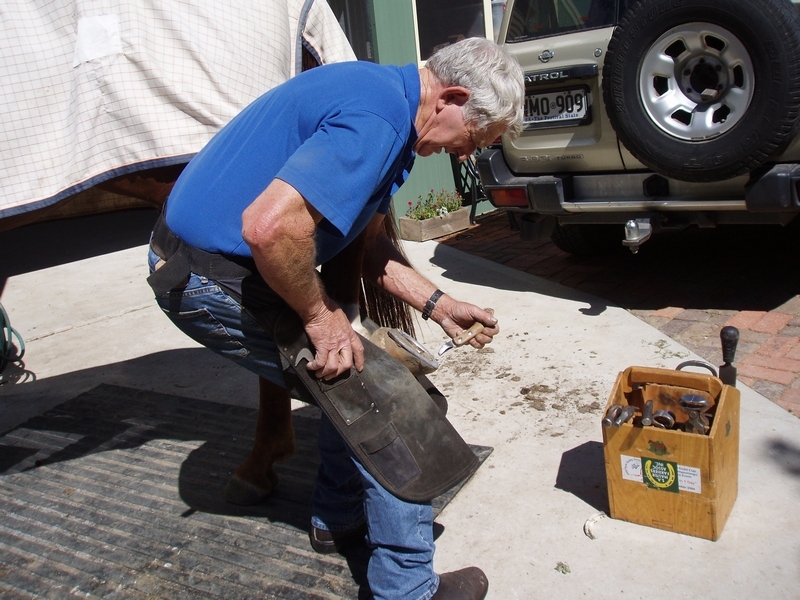 To use a tool box it is a simple matter to place it on the outside of your body away from the horse and stop the horse from stepping on it or in it. I have a magnet in the end of my hammer handle to pick up any nail I drop, as I am far too lazy to bend down far enough to pick up that nail. The farrier had only ever tong clinched, but by the morning of day two, he had learnt how easy it was to hammer clinch, and how much kinder it is to the hoof. I only tong clinch when a horse is hammer shy. Horses love rhythm, and the sound of a regular rhythm when hammer clinching generally relaxes them. (It is important to use the same number of hammer hits per nail when nailing and clenching on every nail – this creates the rhythm, but more importantly for the horse it means that all nails are tightened evenly in the hoof). 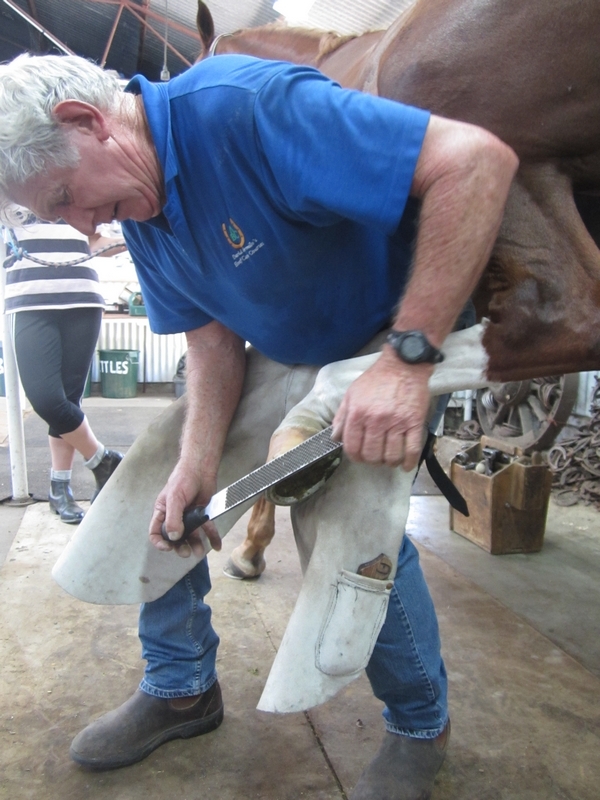 Most farriers don’t remove much sole, if any, making it impossible to correctly balance the hoof. In a hot dry climate like ours, the soles then become hard packed and the hoof eventually becomes sole bound, plus the frog then loses ground contact and can no longer do its job and act as a pump, and starts to shrivel up. Being a lazy farrier, I started making my own sole chisels which make the task of removing excess sole a breeze, and I am now marketing sole chisels. There are no commercially made sole chisels, because as I said before, most farriers don’t remove much sole, if any. I import nylon hammers to sell for use with the sole chisel to save concussion on the hoof, and to lessen the noise on the farrier’s ears. 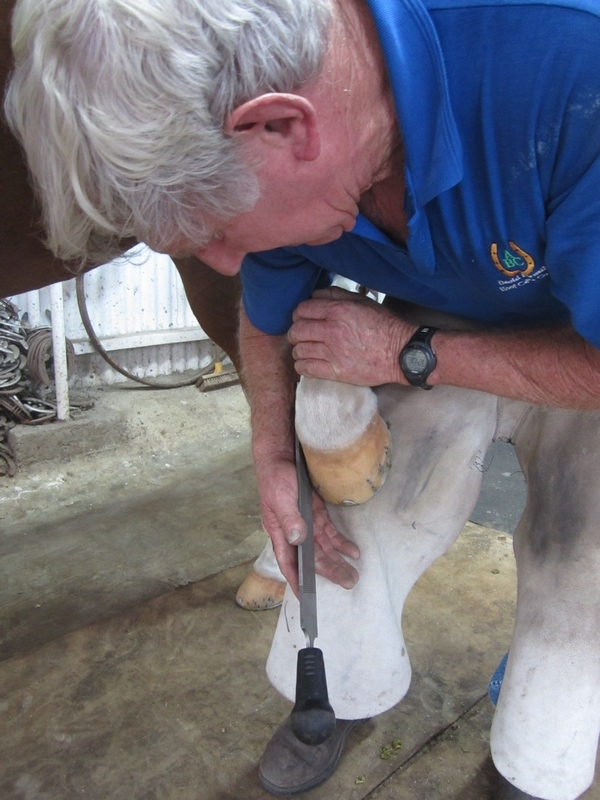 But if the sole is not removed to create a concavity, we cannot lower the hoof wall as it only creates a flat hoof. Being a lazy farrier, I rarely make shoes, as the horseshoe manufacturers have very kindly made their shoes to the shape of the correctly balanced hoof. 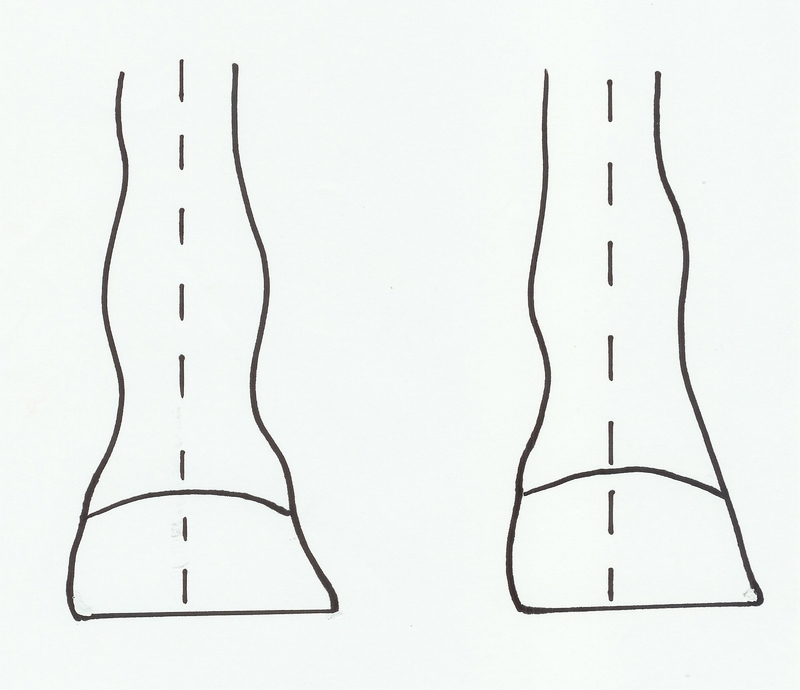 This means that if I correctly balance the hoof each time, I don’t have to adjust each shoe to fit the flares in the hoof, or to fit the distorted growth caused from excess sole. I do have to bump the heels in a little, after battling unsuccessfully for years to persuade the manufacturers to tuck the heels in, because no shoe should ever protrude past the buttress of the heels (Pic 6). Learning to trim and shoe in The Happy Spot is one of my bandwagons and is essential for the lazy farrier. When picking up a horse’s front leg, he has what I call a Happy Spot. This is an area of about one foot square that when you hold the foot up off the ground at the fetlock joint, there is no tension at all, and the horse is standing perfectly balanced and comfortable on his other three legs. That is the spot to work on the hoof. The Happy Spot may be a lot lower than what you expect, it could be a little bit higher, or out the back a bit further, or back under the horse a little, but wherever that relaxed spot is, and where the horse is comfortable, that is where you work. However, most people then pull the leg out another foot, and then up another six inches so they can step in and work on the leg where they are comfortable. (Pic 7) That immediately puts the horse out of his comfort zone, the hoof has been removed from its Happy Spot and the horse will not stand there for more than a few seconds before it starts to shift its weight, pull its leg back and then get branded as an ‘idiot’ or as a ‘bad horse’. 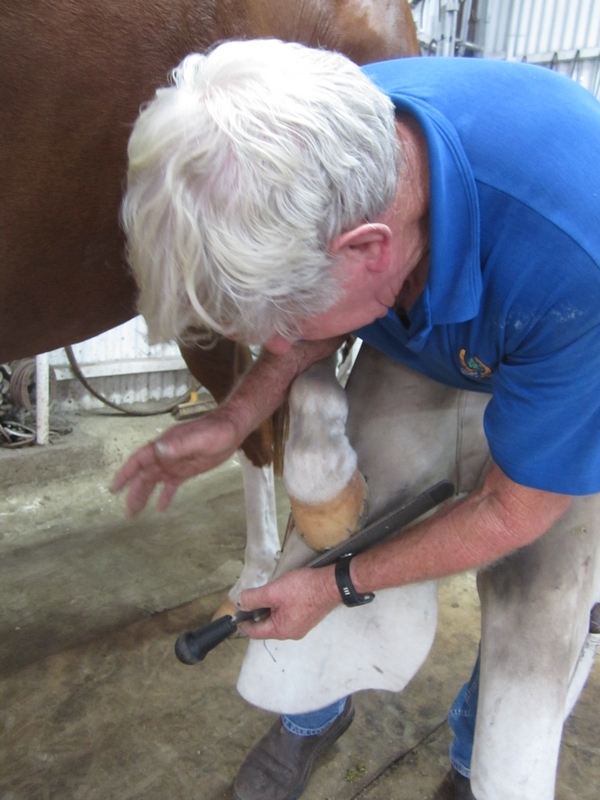 Another tip – when working on the hind leg, the Happy Spot is when the hock is at a 90 degree angle. 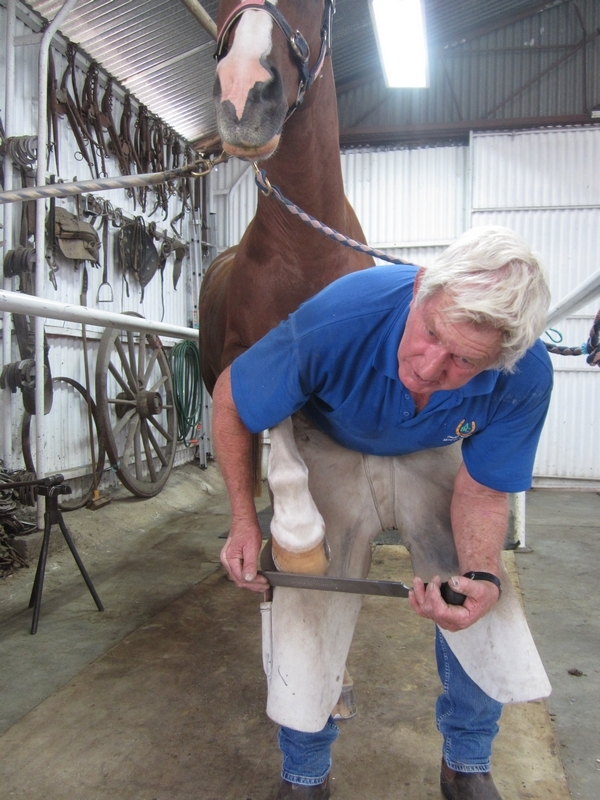 To survive a day as a lazy farrier it is much easier to relax by putting the arm over the hock and leaning into the horse (Pic 8) when bringing the foot forwards. Ditto when taking the foot back (Pic 9). It’s a mutual effort, because you lean over the hock which saves stress on your back, and at the same time you become the horse’s fourth leg, so he relaxes too. Being a lazy farrier, I have a healthy respect for my own survival, and I have 100% respect for the power of the horse as it has the capacity to kill me. Horses are generally very reasonable, and if a horse is fearful of having shoes nailed on, or fearful of men or fearful of lifting its leg or whatever, it almost certainly indicates a previous bad experience. It takes time and patience to win back the confidence and respect and to teach him that everything is going to be OK now. On the rare occasion that a horse is really playing up, and won’t be persuaded to be nice, I get lazy and have no hesitation in calling it quits for the day rather than persisting and spoiling a beautiful friendship. Then I go home and read a book.